Additive manufacturing of hydraulic applications, like hydraulic blocks (adapter blocks), is a powerful alternative to traditional manufacturing methods such as subtractive machining and casting. Because adapting the component geometry to AM allows a much higher level of design freedom, to reduce weight and improve the shape of internal channels for ideal flow. Hydraulic blocks are crucial elements of hydraulic systems. They usually have a compact, square design with multiple internal channels that enables them to control to the oil distribution of large machines or systems in automotive or industrial environments. Heavy-duty agricultural or construction vehicles, like excavator or lift tables and engines require hydraulic blocks as control units. The traditional production of hydraulic blocks causes very high machining costs: Everything starts with a large steel block that is machined with milling and drilling operations to create the internal oil channels. Therefore, first a hole is drilled from above, then one from below. Finally, the two holes are horizontally joined together. Then threads must be cut. To prevent the oil from escaping on the side, a thread with a grub screw is used to close the horizontal connections. The edges create burrs that can’t be removed. Often they are not loosened and thus can’t be eliminated until the block is in operation. The oil flows with a channel pressure that can be easily above of 300 bar. When it hits the connection areas between channels, turbulences will cause large losses and inefficiencies. The grub screw only reaches to a certain point. In areas with no oil flow, like here, dirt reservoirs are formed. They can ultimately cause damage valves or failures in the whole system. The longer the borehole is, the more difficult it is to drill straight. The long drill starts to "flutter" at some point. Danger: If the hydraulic block is compactly built with small wall thicknesses, leaks may occur in adjacent channels. The high pressure of the oil flow can easily cause abrasion and leakage. If the hydraulic block fails, a new one must be ordered. The waiting time leads to a down-time of the machine. The hydraulic block shown above is an existing hydraulic application. Recently the geometries have been redesigned in AM to ensure optimum oil flow. The position of the holes was therefore not changed, while all areas around it were improved. The additive manufacturing process and GKN’s technology allow a totally free geometry design without the risk of bore overlap. Hydraulic blocks produced by AM are considerably lighter and can adapt to the requirements. Let’s compare the traditional manufactured adapter blocks with the additively manufactured block now. I’d like to mention that the original design was not touched at all; this means the block can be exchanged easily and will not cause any problems in the final mockup. Redesigning the block caused weight savings from 30 kg down to 5,5 kg. Positive side effect: The lightweight hydraulic block also improves the handling for the operator. The design of the oil channel does not include any dead or sharp corner. Thus there are also no areas where dirt is collected and can cause problems in operation which would end in damages servo valves etc. The horizontal holes are no longer needed, the oil can now flow around the corner and is not disturbed by corners and edges. 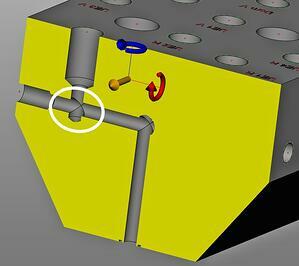 With more complex hydraulic blocks, it is possible to adjust the oil channel lengths to each other. 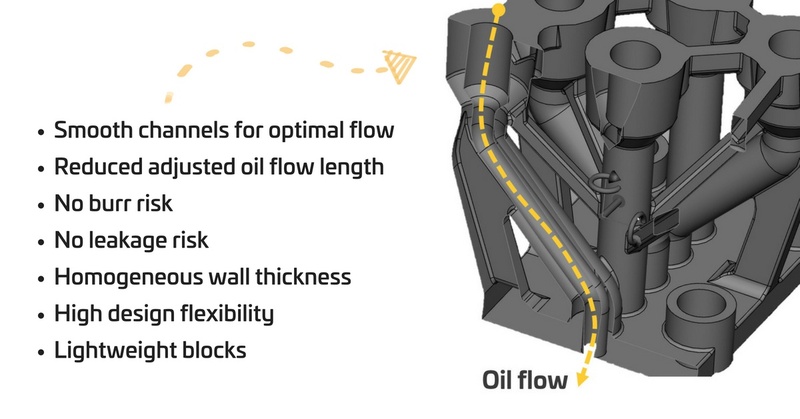 The longer an oil channel is, the more wall friction and losses occur. Shorter channels mean less friction, less risk of leakage. Depending on how complex the system is, the hydraulic block should also react faster and run more stable due less friction. Shorter channels and no sharp corners at which turbulence occurs mean higher energy efficiency. The wall thicknesses can be adjusted as required. Additive manufacturing allows users more time for last-minute design decisions and total flexibility to respond to everything. With AM you can make adjustments to the design at any time. With conventional manufacturing processes, such as investment casting, you have to produce a new tool if you want to change the position of bore holes in order to optimize the oil flow. Existing hydraulic systems can always be redesigned and optimized with additive manufacturing. But also, if you start from scratch, considering metal 3d printing is in any case recommended. Let’s review your project and get in touch with us to get started!